This is the State Traditions podcast, where we discuss the sports, events, towns, and festivals that make America unique. This week Jacob Kirschenbaum, John Willard , and Michael Tucker sit down and talk about the Alabama vs Georgia game, Playoff matchups, the Bowlcember Sale, and other exciting bowl game matchups. 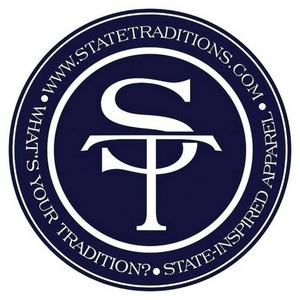 The State Traditions Podcast is back! We've got some great episodes planned for the rest of the year and going into 2019. Unfortunately Jacob is solo this week because everyone else is packing orders from Black Friday and Cyber Monday. He talks college football conference championships and the playoff implications. This week on the podcast John and Jacob go over week 2 of CFB, and look ahead to week 3. Jacob also give a hot take of why cupcake games are good for college football. We also give our tradition of the week and the tailgate drink of the week. Listen for a chance to win a hat, koozie, and sticker of your choice by answering our trivia question correctly. After a summer hiatus John and John are back! We discuss the preseason CFB top 25 and John and John give way to early playoff predictions. This week on the podcast John has a special guest Jacob Kirschenbaum on to talk about the Regions Tradition Golf Tournament in Birmingham and the Preakness Stakes this weekend. This week on the podcast John welcomes a special Guest Mary Martin Messer. They discuss the Kentucky Derby, how to pick horses, Cinco de Mayo and their favorite Mexican restaurants and Margaritas. This week on the podcast John and John talk about some of the new ST Spring items, look at a preview of the NFL Draft and John Willard gives a bold prediction for Dega that could allow our fans to win some ST gear. In this week's episode John and John discuss several events going on in Alabama over the next week or so including Hangout Fest, Mullet Toss, and Talladega. In episode 2 John and John discuss their Masters Picks and Sergio's meltdown, The NHL Playoffs, our sponsorship of the Nashville Predators, and their favorite bars in Nashville. In the inaugural episode of the State Traditions podcast we discuss one of the greatest traditions in America, the Masters. John McElrath and John Willard talk about some of the history, random facts, their experience at Augusta and their top 3 to watch this weekend.